Cold tonight and Wednesday with more light snow! DENVER — A First Alert Action Day continues in effect through Wednesday morning for cold temperatures and a light mix of rain and snow. A FREEZE WARNING is in effect for Denver and the northeast plains of Colorado for tonight through early Wednesday morning. Low temperatures will drop to the upper 20s to low 30s by 7 AM. 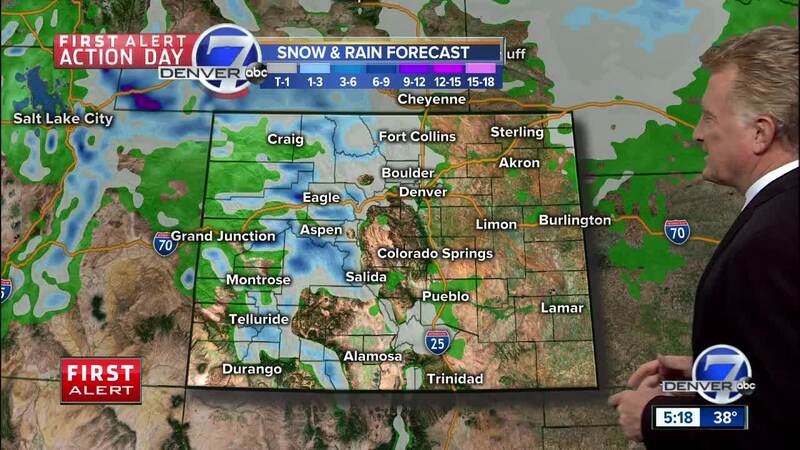 Another weather disturbance will move into Colorado tonight from the west. This will bring more snow to the mountains with 2 to 4 inches possible above 10,000 feet. Lows in the mountains will be in the low to mid-20s by morning. In the Denver area and along I-25, expect cloudy and cold conditions with a mix of light snow and rain, but no accumulation is likely on Wednesday. Western Colorado can expect partly cloudy skies with scattered rain and snow showers on Wednesday. Temperatures will be in the 40s in the mountains and 50s to near 60 degrees in the Grand Junction area. Temperatures will moderate for the end of the week. Expect highs around 60 degrees on Friday with sunny skies for Denver. A new storm will move into the central Rockies for the weekend. Rain will develop Saturday afternoon in Denver with highs in the low 50s. Sunday will be colder with a mix of snow and rain and highs in the upper 30s to around 40 degrees. Snow will be likely in the northern and central mountains this weekend with 4 to 8 inches possible above 10,000 feet. Early next week will be warmer and drier again statewide.